A new DNA study shows that 14th century plague outbreaks might have resulted from repeated introductions of Yersinia pestis to Europe. 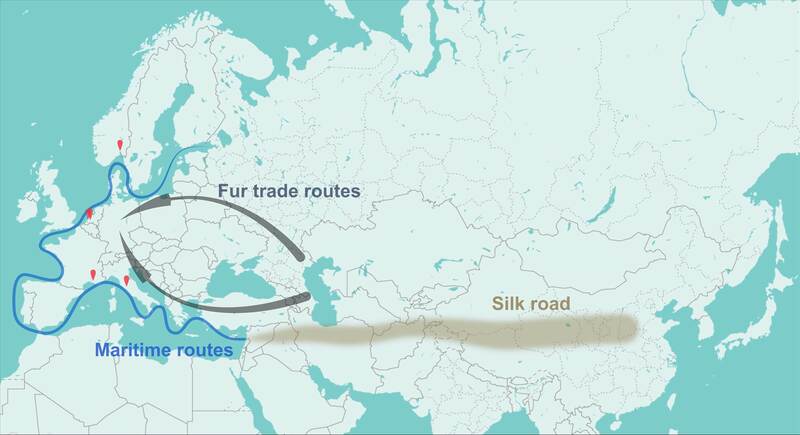 Commercial trade routes, including the fur trade routes, would have contributed to the rapid spread of the Black Death and other epidemics throughout Europe. The bacterium Yersinia pestis is the causative agent of bubonic and pulmonary plague in humans. Plague is primarily a disease of wildlife and is maintained in reservoirs, which nowadays are present on all continents with the exception of Australia and Western Europe. Without doubt, the Black Death, which marks the arrival of Y. pestis into Europe in 1347, represents one of the most significant events that marked the beginning of the second plague pandemic during the medieval period. In fact, from 1347 to 1353, plague spread through whole Europe like wildfire, leading to the decline of the European population by 30 %. After this dramatic period and for more than 350 years, Europe knew a series of recurrent devastating outbreaks of Y. pestis. During the last decades, different studies tried to understand the origin of these outbreaks. Two hypotheses emerged from these studies. According to the first hypothesis, after a first introduction during the Black Death, one or more reservoirs of Y. pestis were established in Western Europe – which explains these recurrent outbreaks. “The other hypothesis suggest that the plague was repeatedly introduced to Western Europe from a reservoir located in Eastern Europe/Central Asia and spread via commercial trade routes and human movement”, explains Professor Nils Chr. Stenseth of the University of Oslo. In a new paper published in PNAS, these two scenarios are investigated using five newly presented ancient genomes (aDNA) of Y. pestis isolated from skeletons distributed in archaeological sites from South (Abbadia San Salvatore, Italy and Saint-Laurent-de-la-Cabrerisse, France) to North Europe (Bergen-op-Zoom in the Netherlands and Oslo, Norway). The ancient genomes from Abbadia San Salvatore and Oslo are the first ancient DNA sequences reported from Italy and Norway. Contrary to previous studies, the authors built an integrative approach aiming at interpreting all ancient genomes of the Second plague Pandemic with regards to their historical context. A total number of 126 Y. pestis strains and fifteen ancient genomes were analysed in this study. Five out of the eleven ancient DNA samples dated to the Second Plague Pandemic were part of the first wave of introduction of Y. pestis into Europe during the Black Death. These ancient DNA samples were isolated from the cities of Abbadia San Salvatore (Italy), Saint-Laurent-de-la-Cabrairisse (France), Barcelona (Spain), London (United Kingdom) and Oslo (Norway). Intriguingly, all these ancient genomes were identical except the one isolated from Abbadia San Salvatore, for which the authors found two extra point mutations. Historical data investigation of contacts and bed testaments conducted by the authors revealed the high percentage of people killed by plague within four months from late June to early September 1348 in Abbadia San Salvatore. Centre for Ecological and Evolutionary Synthesis researcher Amine Namouchi and colleagues advance in their paper that these two additional point mutations were acquired through a large transmission chain in Italy, rather than having been gained within a newly established local wildlife reservoir. Regarding the aDNA found in Oslo, the authors found that it is most likely dated to 1348. This is in line with historical, archeological and radiocarbon dating data described in their paper. While the origin of the Black Death remains unclear, in their PNAS paper, the authors advance a new hypothesis that relates the onset of the Black Death with the arrival of a considerable variety of fur in the ports of the Black Sea by 1340 from trade routes starting from Sarai. In fact, during the same period a new mainland route connecting Sarai, Tana and Caffa had been established with the support of the Golden Horde, observes Amine Namouchi and colleagues. The Golden Horde was originally a Mongol and later Turkicized khanate established in the 13th century and originating as the northwestern sector of the Mongol Empire. The Crimean Khanate and the Kazakh Khanate, the last remnants of the Golden Horde, survived until 1783 and 1847 respectively. Just after the Black Death period, the authors confirm the so-called pestis secunda that occured from 1357 to 1366. “The group of aDNA that belongs to thepestis secundaincludes samples from London, Bolgar-City (Russia) and the newly presented two aDNA from Bergen-op-Zoom. Four point mutations separate the group of aDNA of the Black Death from the group that belongs to thepestis secunda. Corroborated with historical data, we claim that thepestis secundamight also be the result of the introduction ofY. pestisalong the fur trade routes established between Novgorod (Russia) and Western Europe through the Hanseatic League”, adds Namouchi. Overall, in this new paper published in PNAS, by describing all previously and newly described aDNA of Y. pestis in their historical context, Namouchi and colleagues provided additional evidence that the recurrent plague outbreaks during the Second plague Pandemic were the result of multiple waves of introduction of Y. pestis from a reservoir located in Eastern Europe/Central Asia. This result is in line with previous studies based on ecological evidence. Commercial trade routes, including the fur trade route, as-well-as human movement would have contributed to the rapid spread of plague throughout Europe during the Middle Ages.